“The Manmohan Singh Government will go down in history as the most corrupt period faced by the nation. When members of the ruling party and their allies are caught siphoning off money, no rules are sacrosanct and no values sacred. His helplessness in face of the forces against which he has to contend is pathetic. He could have resigned from the Prime Ministership as in that way, at least in part, redeemed his reputation. 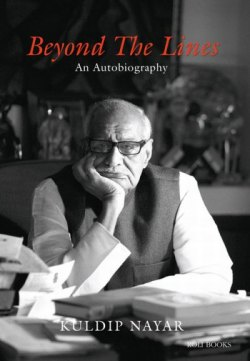 - Veteran Journalist, diplomat and former Rajya Sabha Member, Kuldeep Nayyar in his book “Beyond The Lines, An Autobiography” released this week. 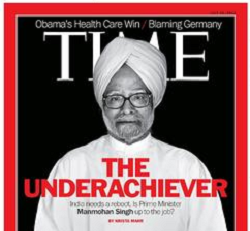 Six years down the line since I made the above observations on the beating that Dr. Manmohan Singh’s image was taking, the international media too has joined the chorus as was evident from the recent TIME Magazine Cover Story entitled the “Underachiever”. India’s domestic media has also adopted this refrain ever since the tsunami of massive corruption scams broke out beginning with the 2G scams and the CWG scams and now extending across the board and touching the doorsteps of the Prime Minister’s Office. There was sympathy then for Dr. Manmohan Singh as a captive of circumstances and that is why in my Column observations in 2006 I stated that his image was taking a beating by default. But in 2012 there seems to be no sympathy for Dr. Manmohan Singh or anyone conceding the benefit of doubt to him because in public perceptions he has singularly failed to stand up tall politically by forsaking as I stated in my observations of 2006 the political company that he has adopted or that adopted him. Along with Dr. Manmohan Singh the image of the Congress Party and the Congress President too is taking a beating in public perception due to the massive failures of the Congress Government in governance, ensuring India’s national security and letting the vibrancy of the Indian economy cumulatively accumulated since the 1990s, to downslide. "A donkey carrying dirty linen to the ghats and the dhobi behind with a whip" - that was the image I had about an year back about so called poor chap. But, after so many scandals opened in public and the way he acted so far(not acting is also an action), I am convinced that despite he acting as a puppet, he is also a party to massive scandals that took place during UPA-1 and UPA-2 misrule. I think, rather than a helpless guy, he is a party contributing to the mess. Further, there are highly placed people in congress, convinced themselves and convincing their colleagues that despite these massive scandals and misrule, their kingdom is not in danger. That's how no damage control, no changes being brought at least to show off in public domain. While travelling from Bangalore to Delhi the discussion among fellow travellers was about corruption, the inability of the government to stem the rot and the Prime Minister. An MBA student, presumably a cartoonist in his spare time pulled out his sketch book to showcase to fellow travellers what he thought of the PM - His sketch showed a donkey carrying dirty linen to the ghats and the dhobi behind with a whip. GREATER GOOD OF INDIA/GANDHI FAMILY. I sense that a lot of people believe that BJP is on the same segment as the Congress is when it comes to governance-and-corruption. I am afraid if this is the correct conclusion. Even if right person is put on the top post in India, given the currently established 'democratic' system, corruption can not be stopped in one day or one month or one year. It will be a gradual process. But first, there need to be minimum sufficient support of elected members to start such a change. Today, each party worker works for the party in hope of getting personal favors in return, not for the purpose of the society and the nation. This is the bitter truth of currently established 'democratic system'. Isn't it ? Then how can any party be found clean from corruption ? Let's review NDA regime briefly. There was genuine effort to curb corruption, Lokpal was discussed in parliament, but not enough votes could be gathered to pass the bill in a reasonable form. Almost half of the ministries were run to rapidly bring change to the nation towards growth, there was hardly any scope of sizeable corruption in those ministries - foreign ministry (headed by Jaswant Singh and then Yashwant Sinha), Finance ministry (the same ministers interchanged in between), the Home ministry, the 'disinvestment ministry' and so on. To recall, the disinvestment ministry consists of just 50 people with 2 IAS officers, to ensure rapid and well controlled work of ambitious NHAI project, an ex-servicemen (Mr.Khanduri) was put in ministry, the then Defense minister Mr. George Fernandez is believed to be incorruptible, and so on.... all this, despite big coalition where many small parties joined NDA merely in hope to get some meat. What was poll agenda of the BJP (and NDA) in 2003 state elections ? (Food, road and electricity ? ), what was main poll agenda of the NDA in 2004 elections ? Wasn't it to bring more developmental work and to focus on rural India to bring them at par ? But, public has very short memory. All this is forgotten, I am amazed, no one (even in the articles by elites) mention the good work of the BJP in those 6 years of rule, no one talks about Mr. Vajpayee, the tremendous leadership he showed (not to forget that he lead coalition of more than a dozen parties, where everyone needs to be kept 'happy'). Alas! what people remember is Karnataka ... simultaneously ignoring Gujarat's progress. And why people forget that the BJP also has to follow the same 'democratic system' that is established in this country by congress, where party worked still expects in return to the service he provides. So, BJP alone can not skip it, as a result, corrupt ministers are bound to be member of it. But why to forget that the suggestions to make every donation to political parties 'public' had come from BJP itself more than a decade ago, where everyone rejected the idea. So, while corruption is not avoidable (until and unless more honest members get elected or some great leader appears in India or the people themselves take it to force the government bring 'Lokpal' like solution, in a manner as the change is being forced by public in Egypt), it is reasonable to expect corruption to be present in rule of any party. But then, does it make BJP and congress equivalent ? A loud ‘NO’ to answer it. While BJP tried to put breaks on corruption, the Congress did just opposite, it accelerated it. And the Congress has been accelerating the corruption throughout its rule since 1947, as evident from the changes in governance in its rule. And more grave is my allegation that the current congress government is not only accelerating the corruption, but it is also involved in anti-national activities. Making import from China of a few consumer goods duty free is one such recent example. The Karnataka crisis is just orchestrated, such corruption issues are existing within almost all state governments. If so, why just Karnataka BJP unit is hit ? And can someone answer why Kumaraswamy and Mr. SM Krishna whose name appeared in the same mining scams, is being ignore both by investigating agencies and the media ? In fact, all congress ministers, whether in state of central covt, are being effectively shielded from both investigation agencies and from the media on corruption issues. Can't you see that happening in front of your eyes ? How can we equate Congress and BJP when it comes to governance - I fail to understand. In democracy, there are only choices to select. If all alternatives are not up to the mark, people should choose the best among them (or the least worst among them !). And by equating BJP to congress, we are simply failing our democracy. Ashok Mitra in his book "A Prattler Tale" wrote about Man Mohan Singh "I am afraid there is little scope for politeness here. His timidity is the product of his civil servant's mind which many mistake as humility" Mitra and MMS worked together for sometime. I think MMS has no courage to act independently. TINA!Does any one see any(worthy)alternative as far as one can percieve? already sinking. When British were ruling,we knew against whom we were to fight.But now, the enemy is within.We as a people are committing suicide.Only Kalki avathar or return of Jesus is our hope.